In general terms, the Romans coined the name 'Gaul' to describe the Celtic tribes of what is now central, northern and eastern France. The Gauls were divided from the Belgae to the north by the Marne and the Seine, and from the Aquitani to the south by the River Garonne. By the middle of the first century BC, the Sequani were located in eastern Gaul, in the area of the modern cities of Dijon and Besançon. They were neighboured to the north by the Lingones, to the east by the Raurici, to the south by the Ambarri, and to the west by the Aeduii. The tribe's name is a simple one to interpret. The proto-Celtic word list gives: Sekʷanā- as a river name, so the Sequana would be the River Seine. In the tradition of Celtic rivers, Sequana was also a goddess, and her worship was especially focussed on the springs at the Seine's source. Called the Fontes Sequanae, 'the springs of Sequana', the headwaters are located in a valley in the Châtillon Plateau, which lies to the north-west of Dijon in Burgundy. This was Sequani territory. 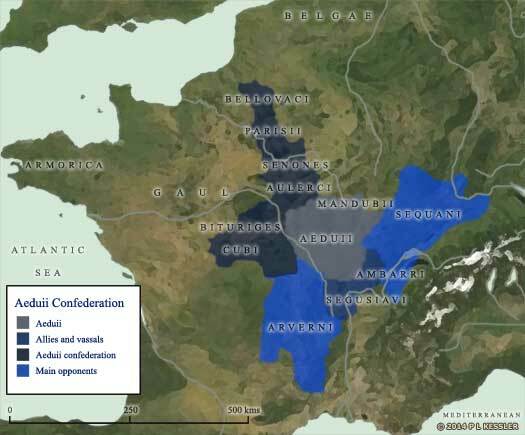 The tribe occupied territory that roughly matches the modern Franche-Comté and a section of Burgundy between the Saône and the Rhone, and the Jura and the Vosges. Allied to the Helvetii, their natural enemies were the Aeduii. They seem to have settled their territory during the fourth century BC, and became a powerful force during the third and second centuries. Decline set in, and their dominance faded. They had an oppidum at Vesontio (modern Besançon, the capital of the Franche-Comté region of eastern France), and other major settlements at Amagetobriga (Mandeure), Luxovium (Luxeuil), and Segobodium (Seveux). The Sequani settle territory in Gaul that they hold onto for the next three centuries or so. They rise to become one of the most powerful of the Gaulish tribes of Celts, remaining so until the end of the second century BC. The defeat of the Arverni by Rome brings the glory days of that tribe to a definite end once its people become part of a Roman provincia. The power vacuum caused by this shift allows the unsubdued Aeduii and Sequani to rise in place of the Arverni, and the two tribes quickly form opposing power blocs in central Gaul. It may have been the rise of the Arverni that resulted in the initial decline of the Sequani, probably not long before this event. It could be around this time that a healing shrine is established by the Sequani at the sacred headwaters of the River Seine - the Sequana after which the tribe is named. This sanctuary is first used in the second or first century BC, and is later continued by the Romans who add two temples to the site. Recognised as a 'friend' by Rome. Son. A 'nobleman' of the tribe. Casticus enters into a conspiracy with Orgetorix of the Helvetii and Dumnorix of the Aeduii to seize control of their respective tribes and between them rule Gaul. The conspiracy is discovered by other senior members of the Helvetii and is quashed. The Helvetii have an impending migration to worry about instead. Ariovistus seizes one-third of the Aeduii territory in the Alsace region, settling about 120,000 Germans there. However, with the Sequani now at his back, between him and Germania, he decides to clear them out of their Doubs valley homeland. More German settlers are introduced there, and a further third of Sequani territory is demanded for his allies, the Harudes. This latter tribe go on to harass the Treveri to such an extent that they send an ambassador to Caesar. The showdown happens at the Battle of Vosges following an unsuccessful face-to-face parley between the two leaders. The Sequani, Leuci and Lingones have supplied his troops with corn as promised, so now he is ready to face the Germans. The Suevi host lines up in units of tribal groups, but superior Roman tactics breaks the line and the Suevi host makes a run for the Rhine. Ariovistus makes it across, but many of his allies now turn on him and the core Suebi. The defeated Suevi now avoid the Rhine for generations, concentrating on building a fresh confederation in central Germania. The Sequani are forced to hand all the land that they have gained from the Aeduii to Julius Caesar, thereby sowing the seeds of later rebellion. Four relief forces amounting to a considerable number of men and horses are assembled in the territory of the Aeduii by the council of the Gaulish nobility. 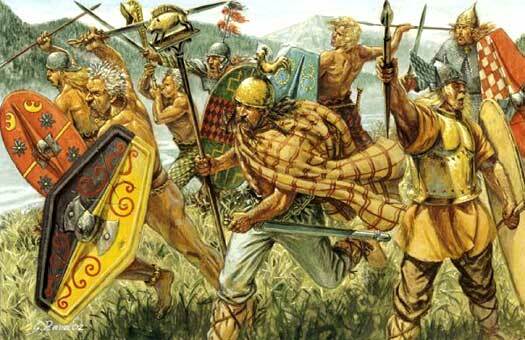 Among those demanded from the tribes of Gaul are twelve thousand men each from the Bituriges, Carnutes, Ruteni (mostly archers), Senones, Santones, and Sequani. Together they attempt to relieve Vercingetorix at the siege of Alesia, but the combined relief force is soundly repulsed by Julius Caesar. Seeing that all is lost, Vercingetorix surrenders to Caesar. The garrison is taken prisoner, as are the survivors from the relief army. They are either sold into slavery or given as booty to Caesar's legionaries, apart from the Aeduii and Arverni warriors who are released and pardoned in order to secure the allegiance of these important and powerful tribes. During the reign of Augustus, the district of Sequania becomes part of the Roman province of Gallia Belgica. A conference of the Gauls in the land of the Remi results in Rome receiving support from various Gaulish tribes. This includes the Mediomatrici, Sequani, and Tungri, with the Sequani having already been attacked by self-proclaimed emperor, the Lingones noble, Julius Sabinus. Rome now forces Civilis to retreat to the Batavian island where he agrees peace terms with General Quintus Petilius Cerialis. His subsequent fate is unknown, but the Batavi are treated with great consideration by Emperor Vespasian. 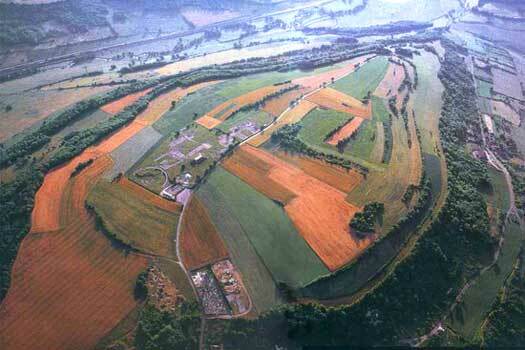 During the revolt, the Roman fortress ceases to be used (for obvious reasons) and the Oppidum Batavorum is razed. Quintus Petilius Cerialis soon gains the post of Governor of Britain in reward for his triumph while the Sequani, in return for driving back the rebel forces, are afforded a triumphal arch at Vesontio. With Roman authority gradually fading the former Sequani are so ingrained into Roman civilisation that they are unable to reform their tribal status and protect themselves. Instead, when the Burgundiones cross the Rhine en masse they occupy the Sequani territory as their own, with recognition by a helpless Rome that they are an allied state. The Sequani are gradually subsumed into what eventually becomes modern French culture and language.